Loud Security Systems – 2014 Small Business of the Year. 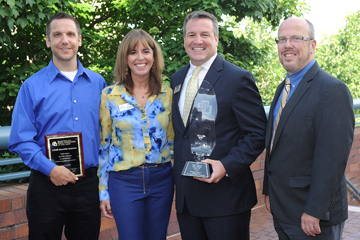 LOUD Security Systems was named the 2014 Small Business of the Year by the Cobb Chamber of Commerce at the Chamber’s June First Monday Breakfast, presented by The Atlanta Journal-Constitution. Established in 1995 by John Loud, LOUD Security Systems has grown into a well-known and respected low voltage contractor focusing on the installation, maintenance, and monitoring of residential and commercial security systems. The company, based in Kennesaw, is committed to combining ethical work processes and advancing technology while providing quality customer service, peace of mind, and enhanced home services with current easy-to-use products, that individualize the needs of every customer. While serving in Cobb County, LOUD Security has built their success on a combination of factors including: building, retaining and growing the recurring revenue system. Customer satisfaction is very critical because the revenue is spread over a long customer relationship. LOUD Security is focused on providing a higher level of customer interaction than other competitors. The company is small enough that the customer feels the “hometown” touch, but large enough that there are processes in place to make sure the billing is accurate, the information at the central station is correct, that people will trust LOUD Security to protect their loved ones and property. LOUD Security may be busy providing individual care to thousands of customers, but employees are dedicated to finding ways to serve the community. Last year, LOUD Security provided contributions to the Big Shanty festival, Taste of Kennesaw, and Taste of Acworth through sponsorships or donations of time and money. As the Chamber’s 2014 Top Small Business of the Year, LOUD Security Systems will compete in the state’s small business of the year competition. Pictured above l-r Eric Widner, Operations Manager; Dianne Alderman, Comptroller, John Loud, President, John Bennet, Director of Sales.